Like most of the international media, Anne Applebaum is off base regarding her assessment of the Visegrad nations of Central Europe (Hungary, Poland, Slovakia and the Czech Republic) and the results of the Czech presidential election. It is true that many Czechs find President Milos Zeman’s personality offensive and downright embarrassing at times. Others relish his frankness. While the overwhelming majority (80%) of Czechs strongly agree with Zeman on migration, many of these same voters were uncomfortable with his mannerisms and theatrics. As I wrote before the election, these conflicted voters who disliked Zeman but also vehemently reject the migration agenda of the EU would be the deciding factor. Like the US elections, I suspect many told their friends one thing but voted differently in private. However, Applebaum is wrong to label Zeman and the leaders of Hungary and Poland as “anti-European”. They may disagree with many of the EU “diktats”, but they are obviously not “anti-European”. Many Europeans, especially in Central-Eastern Europe (CEE), simply reject the notion that the so-called EU “core values” of Brussels are universal “European values”. In fact, Poland and Hungary promote Catholic, conservative values that often clash with the multicult theology of Brussels. This does not make them any less “European”. Moreover, some EU federalists are promoting a “United States of Europe” while others, like the leaders of Visegrad and Austria, believe the strength of Europe are the nation states. For instance, Polish PM Mateusz Morawiecki said a “strong, integrated Europe” should be based on a group of sovereign, national member states rather than an increasingly centralized federation. 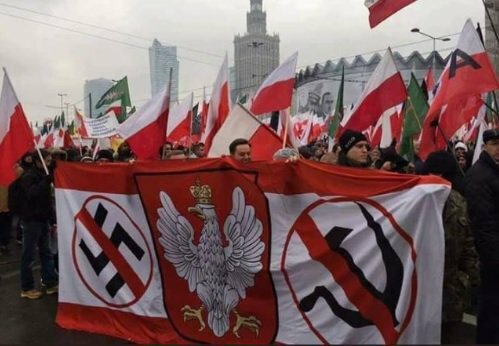 Indeed, Warsaw and Budapest have become the leaders of the mainstream rebellion, clashing with the leaders of Brussels over migration, sovereignty and federalism. Poland has drawn the most resentment from Brussels (Hungary has been the other target) since the conservative Law and Justice (PiS) party won the election in late 2015 and swiftly acted to reject the forced migrant quotas and to reform a corrupt judicial system tainted by lingering communist influence. In addition, the four Visegrad countries have repeatedly rebuffed demands from Brussels and western Europe to host some of the millions of migrants who were granted “open-entry” – often without identification – to Europe. The actions of Brussels and Berlin regarding migration and the surrendered external borders in Italy and Greece have undermined Visegrad’s trust in the EU. Applebaum also misreads Central Europe, which has a much different vision regarding migration than France, Belgium and others in Western Europe. Contrary to Angela Merkel’s “solidarity” myth, there was never any “European solidarity” for Open-borders and mass migration. From the beginning, the V4 wanted the borders secured and safe camps for the refugees set up outside of the EU. To this day, the Visegrad nations continue help other states secure the internal borders while providing efficient and effective aid to the refugees closer to their homes – in Iraq, Syria and the camps in Jordan. However, for the leaders of Visegrad, the idea of allowing hundreds of thousands of migrants – without knowing who they are first – to enter Europe from regions well known for persecuting non-Muslims and containing ISIS jihadists who have declared Europe as their “next Syria” was not compassion but an act of negligence. While it was easy for Applebaum and others in the US media to vilify Hungary, they were not at the Hungarian border to experience the violent behavior of some of the migrants – who were overwhelmingly aggressive males. Visegrad will cooperate when merited; however, they will not just “roll-over” and no longer consider themselves “subjects” of Berlin. If their beliefs and national interests are challenged, they will defend their people, culture and sovereignty. This is how strong and confident leaders act. While many will not admit it, more are starting to realize that Hungary’s PM Viktor Orban was correct, as Germany and the EU increasingly adopt the measures put forth by Orban early on. Contrary to weakening their position in Europe, Visegrad earned respect and confidence by challenging the reckless policies of Angela Merkel. They changed the entire debate on migration in Europe. Applebaum, like most neocons, also drastically overplays the “Russian card” every time democracy produces the wrong results. Yes, there was a Russian influence….as well as heavy meddling by US neocons and pro-Berlin “think tanks”. However, Czechs are not naive as Applebaum suggests; they were just focused on other issues, such as migration, Zeman’s offensive personality or the arrogance of his opposition at the “Prague Cafe”, a loose society of “intellectuals and media elite” often pushing an agenda at odds with the beliefs of its citizens and habitually belittling certain segments of society which challenged their beliefs. By all accounts, Zeman was an extremely vulnerable candidate. However, his opponent embraced “EU solidarity” and the so-called “core values” of Brussels. Many believed Drahos and his advisors would have tried to distance the nation from their natural partners at Visegrad in order to embrace the EU Core. In rejecting this vision, the country is poised to continue in the same direction as its neighbors in Central Europe. In the end, the Czechs did not vote to leave the EU or NATO; they voted to reject the so-called EU Core dominated by Berlin and Paris. Applebaum may not like the results, but this is the reality of the situation. The culture and core of the Czech Republic is Visegrad and Central Europe, not the “NoGoZones” of France and Belgium. Poland, Hungary, Slovakia and the Czech Republic may not have earned “blue and gold” stars from Brussels, but they answered the bell and took the tough but necessary preventive measures to protect their people, culture and nations. The international media may not understand this, but the citizens of these four nations do.